Dhankuta is a village located in Eastern part of Nepal and this type is made only in this village. People mostly use it as a decorative piece because of its elegant and delicate look therefore it is named as Dhankute. The skilled craftsmen from the village make special scabbards from water buffalo horn depicting national symbols and pride marks of Nepal such as Kings crown (Shree-pech), national bird (Danfe), national flower (Laligurans), national fish (Aasla), Gurkha insignia (khukuri cross, mark of a temple (Pashupati chaana), the holy sword (Trishul) etc. It is made very simple yet very attractive. However this Dhankute by the skilled craftman from this village came out so special that we had to call it Royal. It is the most beautiful Dhankute ever made by hand. It all happened because of this beautiful white colorful buffalo horn that made this possible as horn as white and colorful as this is very difficult and rare to find making this Dhankute the only one in entire Nepal that can not be duplicated. A Dhankute like this takes months and only can be made if white horn is found again. One can even see how transparent the horn is when exposed in the light. 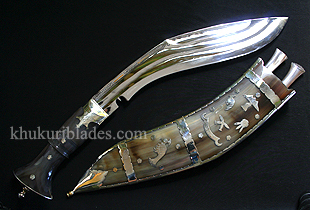 The blade of this kukri is crafted in such a special way that one can see three layered steel. Customers are requested to wait months for such a master piece like this at the showroom of Khukuri House Thamel. *Note: KHT warns customers that we need at least month to finish a Royal piece like this and the next ordered piece can come out a little different due to nature and color of the horn.